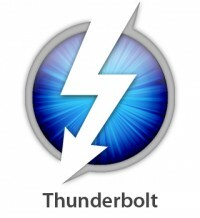 Thunderbolt is a new standard from Intel, which is used right now only on the latest Apple MacBook Pro, but since it’s a product from Intel, it is expected that many others will follow. This is an I/O technology that allows for the connection of peripherals to a computer in a simpler way than it is done right now (with many different types of connection types). 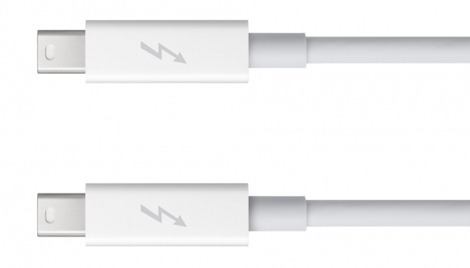 Thunderbolt will work with both DisplayPort and PCI Express devices, so it’s a dual-protocol tech, allowing you to plug in different types of devices in the same Thunderbolt port. For example, you can plug in Mini Display port devices, plus, with the help of an adapter you will be able to also plug in VGA, HDMI and DVI displays. This port comes with two different channels, so you will have full bandwidth for both of them, allowing you to daisy-chain devices on it (you can chain six different connections on a single Thunderbolt connection). The technology behind the Intel Thunderbolt allows for much faster speeds than the current standards. It’s a dozen times faster than a Firewire 800 and twenty times faster than the USB 2.0 standard. The researchers that are working on it expect its speed to grow by the end of this decade to around 100 Gbit/s. If you need an example of its power, copying a BluRay disk (over 20GB) takes around 30 seconds right now, but it should be even faster in the future. Right now, Apple MacBook Pro laptops are the first ones to come with this tech on it, but it’s the kind of thing that has many pro’s, so in time more and more people will adopt it. The nice thing about it is that you will still be able to use your USB or eSATA products with Thunderbolt ports, so it doesn’t make your old hardware obsolete. Some of the companies that are already working on making products which work with this standard include Western Digital, LaCie, Promise, Avid, Apogee, Blackmagic and Aja. While the products being designed right now are mostly developed for professional users that need high speeds, in time the price will go down enough that it will be a viable option for the regular consumer.